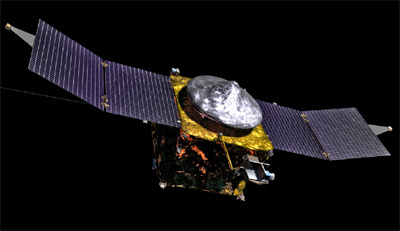 MAVEN (Mars Atmosphere and Volatile EvolutioN) ia a $485 million mission launched in late 2013. The selection was evaluated to have the best science value and lowest implementation risk from 20 mission investigation proposals submitted in response to a NASA Announcement of Opportunity in August 2006. Mars once had a denser atmosphere that supported the presence of liquid water on the surface. As part of a dramatic climate change, most of the Martian atmosphere was lost. MAVEN will make definitive scientific measurements of present-day atmospheric loss that will offer clues about the planet's history. The principal investigator for the mission is Bruce Jakosky of the Laboratory for Atmospheric and Space Physics at the University of Colorado at Boulder. The university received $6 million to fund mission planning and technology development during the next year. NASA's Goddard Space Flight Center in Greenbelt, Md., managed the project. Lockheed Martin of Littleton, Colo., built the spacecraft based on designs from NASA's Mars Reconnaissance Orbiter and 2001 Mars Odyssey missions. The team began mission design and implementation in the fall of 2009. After arriving at Mars on 22 September 2014, MAVEN will use its propulsion system to enter an elliptical orbit ranging 380 km × 44600 km above the planet with an inclination of 75°. The spacecraft's eight science instruments will take measurements during a full Earth year, which is roughly equivalent to half of a Martian year. MAVEN also will dip to an altitude 80 miles above the planet to sample Mars' entire upper atmosphere. During and after its primary science mission, the spacecraft may be used to provide communications relay support for robotic missions on the Martian surface.